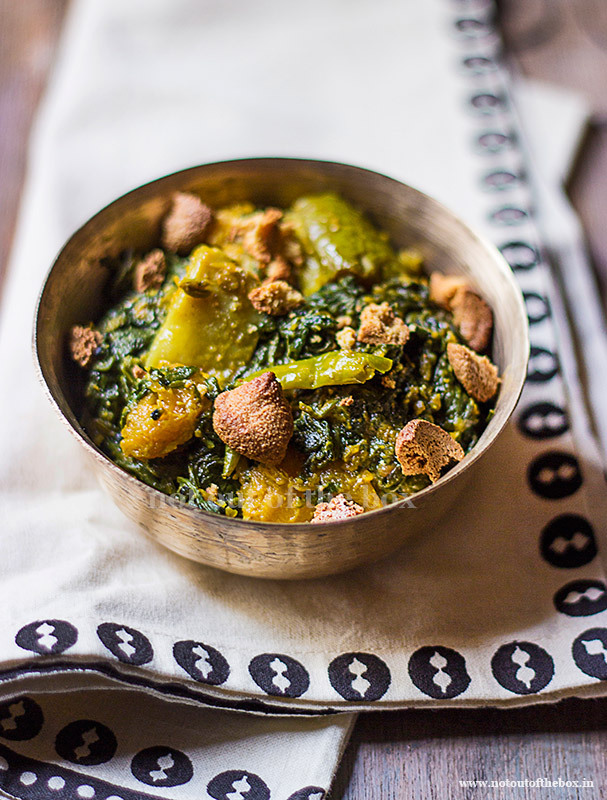 ‘Ghonto’ is a mishmash of any leafy green with veggies. In this, Pumpkin, Eggplant, and Potatoes used as primary veggies along with the greens, radish often added whenever in season. Known as a versatile leafy vegetable Spinach which is rich in iron and vitamins cooked here in a healthy way to retain most of its benefits. Lentil dumplings (Bori) adds a beautiful crunch to this Paanchphoron flavoured dish. Easy to cook, Palong Shak er Ghonto usually served with steamed rice and dal right after having the bitter side dish in a typical Bengali lunch spread. Roughly chop the spinach and put them in a colander, wash well under running water, keep aside to drain. Cut eggplant, potatoes, and pumpkin into cubes. Wash and keep aside. Heat 4 tbsp oil in a deep frying pan and sauté the lentil dumplings on low heat until brown. Remove and keep aside. Now heat 1 tbsp oil again, temper with dry red chilli and paanchphoron. Once it splutters add ginger paste and sauté quickly for a few seconds. Next to add all the veggies except spinach. Add in ½ tsp of turmeric powder, green chillies, and salt. Mix well, cover and cook on medium heat for 5-6 minutes, stir in between. Now add the spinach, mix, and cook, covered on low heat until everything become tender. Check salt, remove from the heat and transfer to a bowl. Garnish with crushed lentil dumplings. It is such simple and a delicious recipe! I use paanch phoron in many of my dishes now as my daughter loves the smell of it! The best is in the dal!